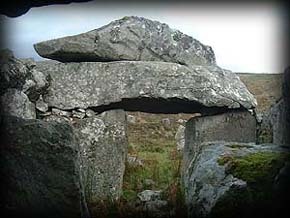 Shalwy Court tomb is situated on very marshy land about 3 kilometres east of Kilcar. 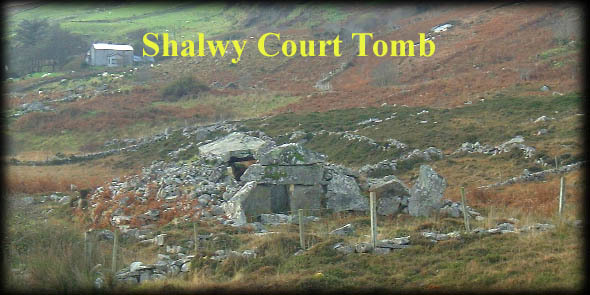 There are two very fine court tombs in this area , the second tomb Croaghbeg was inaccessible as the ground was too soft and boggy to reach it. 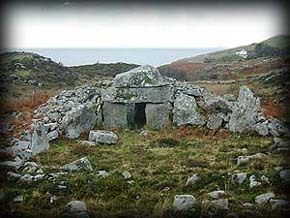 As you can see from the image left the tomb has lintelled portals and the top stone is gabled, you can see this clearly in the picture below taken from inside the tomb, there are two chambers in this tomb and also in Croaghbeg. 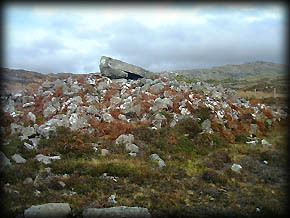 The image below was taken from behind the tomb and shows that nearly all the cairn has survived, in fact, it would be very hard to spot the tomb if you approached from the South West. I hope to visit Croaghbeg and Shalwy in the spring of next year, so I may have more pics then. Situated: On marshland to the west of the road about a mile beyond Largy, on the Killybegs to Kilcar road, R263. Discovery Map 10: G 6474 7531. Last visit Nov 2002.